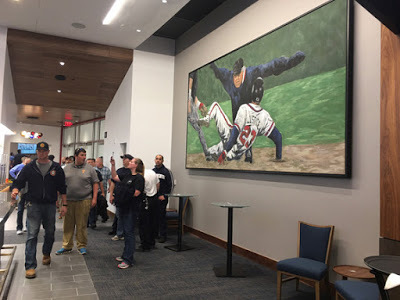 The painting you see is one of three large-scale pieces of art that I created for the Atlanta Braves new SunTrusk Park baseball stadium in Atlanta, Ga. It is of David Justice a former outfielder and designated hitter in Major League Baseball who played for the Atlanta Braves (1989–1996). I created three pieces this size and will see other post of the other paintings on this blog. Although I have created sports art for a number of other stadiums the three MLB baseball pieces I painted of Atlanta Braves players are the largest. The other two pieces are of Chipper Jones and the other is of Dale Murphy. All three of the pieces are on display in the Delta Sky Club area of the SunTrust Park stadium. I am always curious about some of the things athletes say. Here is an odd one attributed to David Justice. “I mulled over what he had told me as I savored the Scotch. Not bad, really — like a beer that’s been in a brawl.” The real question about this quote is who was David Justice drinking Scotch with that made that statement to him. I have no idea. The painting of David Justice by sports artist John Robertson is 8 feet by 15 feet, acrylic on canvas.